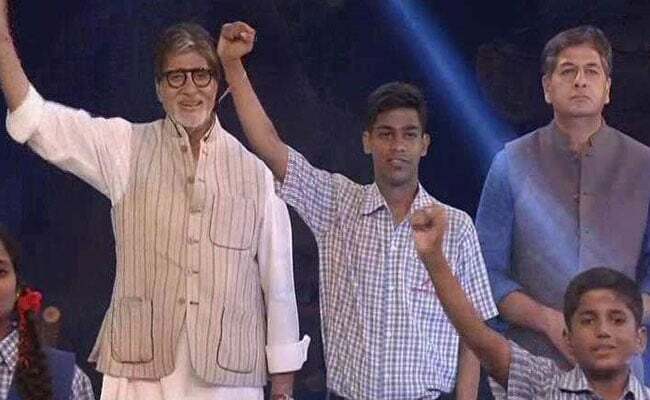 The 12-hour long Dettol-NDTV Banega Swachh India cleanathon ended with the national anthem being performed by a group of differently abled kids, as brand ambassador Amitabh Bachchan took centre stage to end the event with a salute. 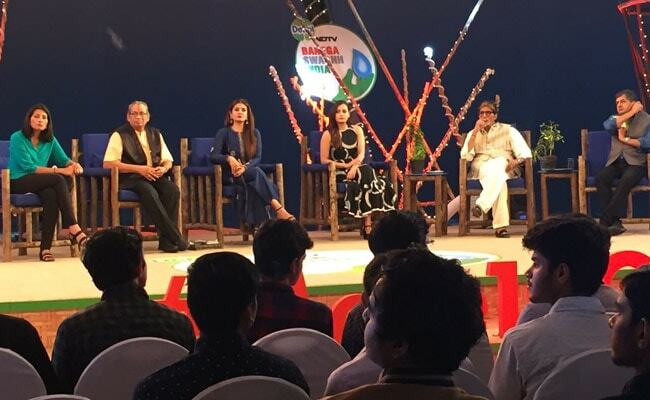 Wrapping up the 12-hour Banega Swachh India cleanathon, brand ambassador Amitabh Bachchan says that despite differences, there was unity in what people said about cleanliness. We must introspect why the voices are not reaching the millions of people out there. We should work every day towards cleanliness and how much of the efforts are getting implemented, should also be looked into. We need millions of people who should think together. We must get together and think alike and inevitably become a better and cleaner nation. Mr Bachchan also thanked the volunteers participating in the cleanliness activities across the country during the cleanathon. Manual scavenging should be made the number one focus for the next one year, says Nitish Kapoor of RB, in the final few minutes of the cleanathon. Alia Bhatt says that we should create more awareness and adopt #Mere10Guz with further seriousness. 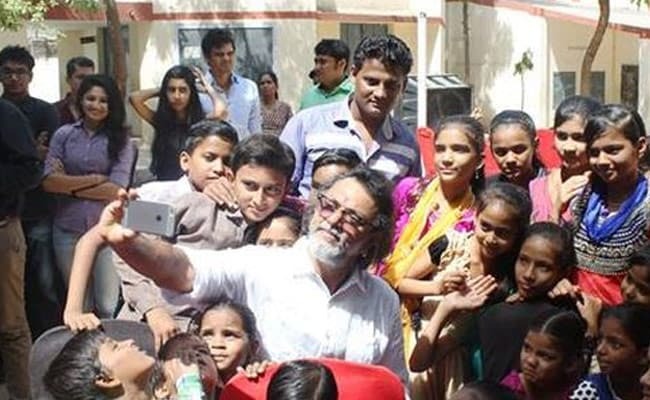 Rakeysh Omprakash Mehra says that we must be responsible for ourselves and pay our debt to the society. Manual Scavenging should be made the number one focus for the next one year, says Nitish Kapoor of RB. 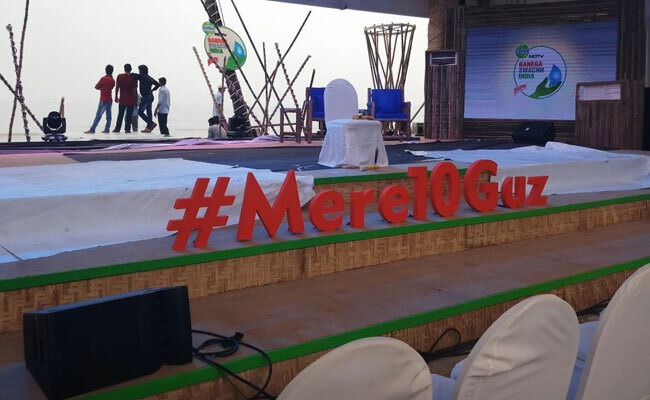 Alia Bhatt says that we should create more awareness and adopt #Mere10Guz with further seriousness. Rakeysh Omprakash Mehra says that we must be responsible for ourselves and pay our debt to the society. Zarina Srewvala, Managing Trustee, Swades Foundation says that they have built more than 17,000 toilets across several gram panchayats. Their WASH programmes across 300 schools have seen students generate awareness on toilets among parents and elders as well. Alia Bhatt says that awareness is the only to realise that something more needs to be done for change to take place. There are innumerable reasons why there is need to contribute to the Swachh Bharat Abhiyan. Even taking on an area on a monthly or quarterly basis can make a difference. Amitabh Bachchan says that youngsters who look up to people like Alia Bhatt can do a lot to ensure that change in cleanliness scenarios actually take place. Alia Bhatt joins the panel at the Banega Swachh India cleanathon. Jaggi Vasudev: All the policies concerning our rivers was about how to share the waters. Now we are talking about how to revitalise our rivers. Ganga accounts for 33% of India's agriculture but in the last few years 94% of forest cover near the Ganga basin has been removed. Forest based agriculture more viable option for farmers residing near the Ganga basin and they need not give up their land. It is an economic module with an ecological impact. Rakeysh Omprakash Mehra says that when he visited Sabarmati, he thought of Gandhi and how Gandhi was the architect of freedom in India. But apart from that, Gandhi was also highly interested in sanitation and the work he did on toilets was incredible. Along with the NGO Yuva, which has 1,50,000 volunteers, Mr Mehra has adopted 601 schools and slums with nearly 10,000 toilets built in total and maintenance infrastructure for two years. In the sites Mr Mehra's NGO has worked, there has been an 86 per cent rise in girls coming back to schools where toilets have been installed. Rakeysh Omprakash Mehra says that when he visited Sabarmati, he thought of Gandhi and how Gandhi was the architect of freedom in India. But apart from that, Gandhi was also highly interested in sanitation and the work he did on toilets was incredible. Along with the NGO Yuva, which has 1,50,000 volunteers, Mr Mehra has adopted 601 schools and slums with nearly 10,000 toilets in total and maintenance infradtructure for two years. In the sites Mr Mehra's NGO has worked, there has been an 86 per cent rise in girls coming back to schools where toilets have been installed. 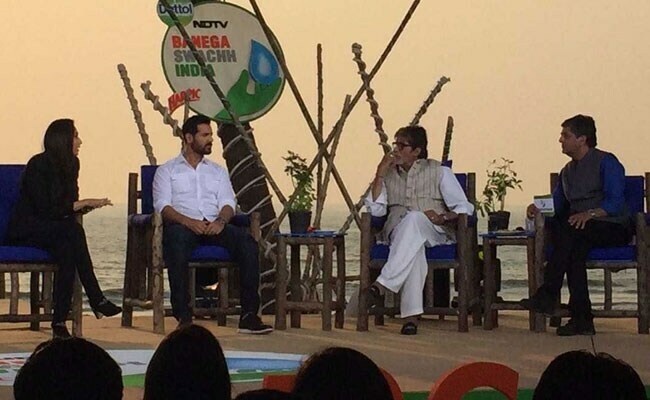 Filmmaker Rakeysh Omprakash Mehra and Afroz Shah, the architect behind the Versova beach cleanup join the Banega Swachh India cleanathon panel. Mr Mehra says that he has already built 601 toilets. Afroz Shah says that criticisms should be directed at self. Amitabh Bachchan, says how Afroz Shah requested for an excavator from him and was presented with an excavatator, a tractor and a trailor to aid him in his garbage collection process. Singer Anwesha Dutta Gupta lights up the cleanathon stage on the occassion of Gandhi Jayanti with her rendition of Mahatma Gandhi's favourite bhajan, Vaishnava Jan To. 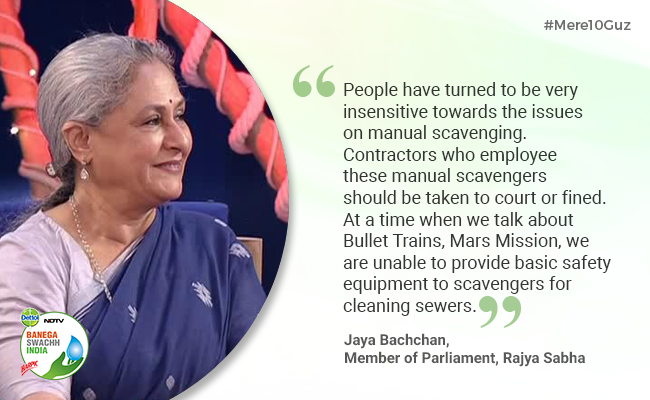 Jaya Bachchan, Member of Parliament says that people have become insensitive towards the issue of manual scavenging and despite talking of technological achievements, we have been unable to provide safety equipment to people employed in cleaning sewers. Mr Wilson says that modernisation of sewage system a must to eradicate manual scavenging. The 2013 Act on Manual Scavenging clearly states that anyone employing manual scavengers should be imprisoned for a year. Construction of toilets not enough as dry toilets still exist. Sewage treatment plants are a must to treat sewage via mechanisation and so that manual scavengers are not employed. 1.6 lakh women still clean human excreta and 117 people have already died in 2017 and unless these problems are solved, there is no point in celebrating the success of Swachh Bharat. Magsaysay Award winner Bezwada Wilson and founder of Safai Karmachari Andolan, says that the government policy is the reason behind the deaths of manual scavengers. 1,470 deaths happened in India since the Supreme Court judgment on manual scavenging. He says that police stations, court and political will have repeatedly not shown any interest in eradicating manual scavenging. 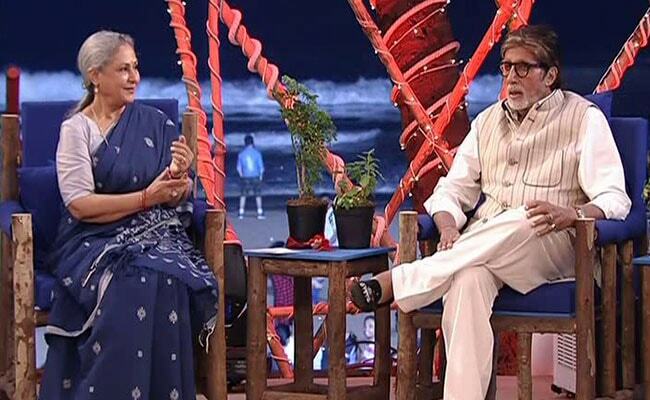 Jaya Bachchan, Member of Parliament, joins the panel at the Banega Swachh India cleanathon. Jaya Bachchan talks about the issue of manual scavenging and says that despite raising the question on manual scavenging on several high platforms without any avail. Sensitive and conscious people have raised the question on manual scavenging. Talking about contractors who employ manual scavengers, Mrs Bachchan says that justice must be swift and fast in courts. 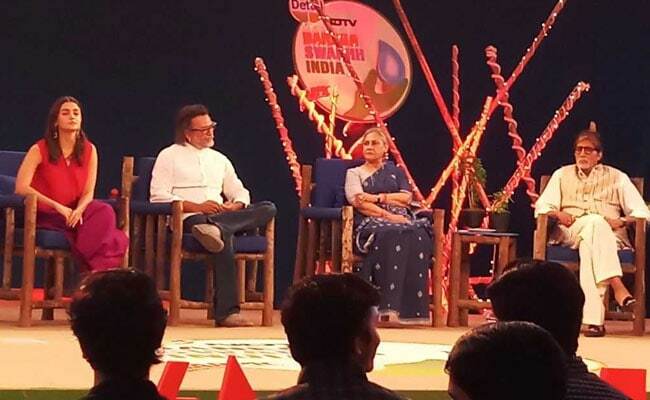 Jaya Bachchan joins the panel at the Banega Swachh India cleanathon. Professor Rajagopalan Vasudevan says that he needs 100 lakh tonnes of plastic to construct pavements across highways across India. 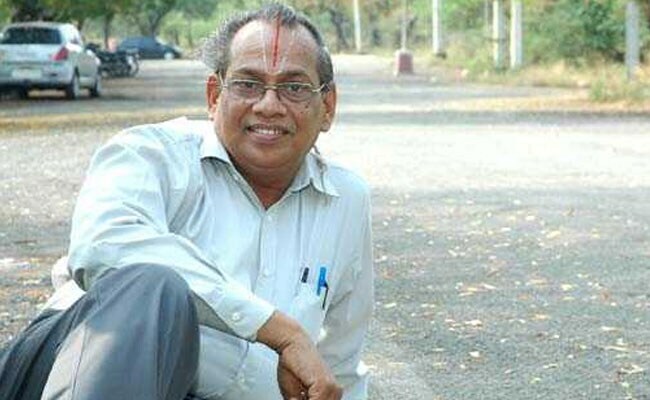 India's plastic man Professor Rajagopalan Vasudevan joins the cleanathon. Prof. Vasudevan firmly believes that one person's waste is another person's treasure. The Madurai resident has built roads using plastics instead of dumping them into garbage. His technology has been used across 15 districts all over India. Tony Ribbink, CEO and Founding Trustee of Sustainable Seas Trust joins the cleanathon to talk about pollution in the oceans. 3 tonnes of fish are caught in the sea every day and continuing plastic pollution could result in more plastic in oceans than fish by 2050. Mr Ribbink says that the most obvious solution is to stop the plastic from entering the sea. Governments, municipalities and schools have a huge role to play to ensure that plastic does not go into the river. Plastics from ships must also be stopped from entering the oceans. Over 20,000 crores has been spent on cleaning several of India's rivers but to no avail. 7,000 million litres of untreated sewage every day is disposed in the Ganga. The pathetic state of all of India's rivers is a cause of concern as almost all of India's major rivers. 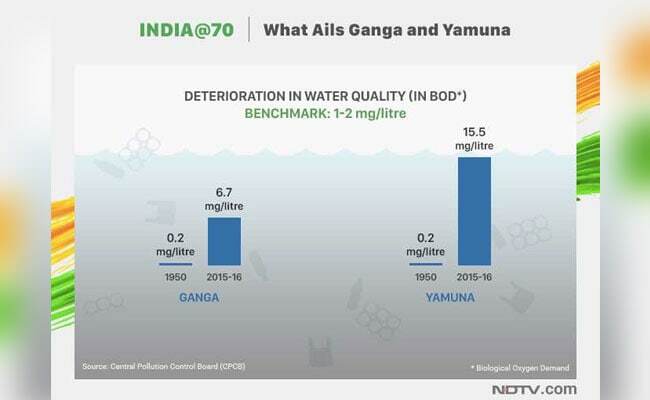 The Ganga and Yamuna remain two of the world's dirtiest rivers and despite several conservation efforts, the status of these two rivers has kept deteriorating. 18-year-old Bilal Ahmad Dar, the brand ambassador for the Srinagar Municipal Corporation, says that the Wular lake, which he has been cleaning since 2007 is highly polluted. 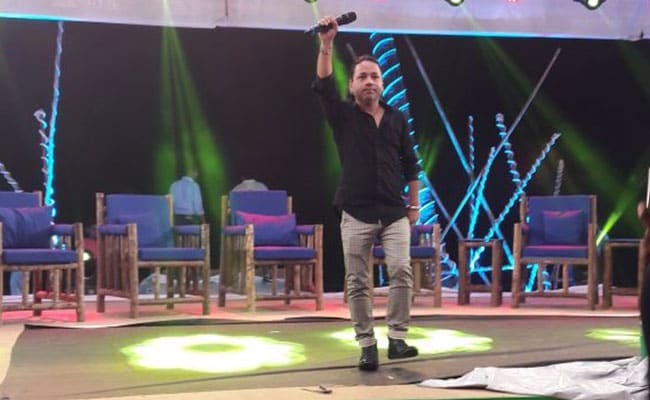 Bilal says that encouragement from Jammu and Kashmir Chief Minister Mehbooba Mufti, as well as Prime Minister Narendra Modi has further encouraged him to continue with his Swachhta initiative. 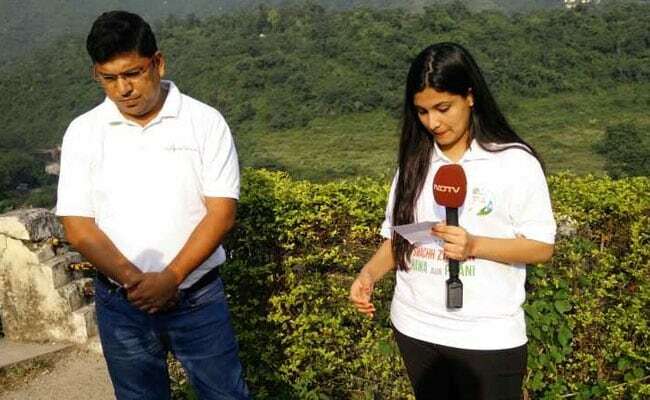 Srishti Bakshi, Founder, CrossBow says that she has covered a distance of more than 3,000 kilometres to empower women in each and every household and ultimately eradicate open defecation in India. She has collected 66 lakh steps and aims to collect a billion steps and conducts workshops which give out the messages of health and sanitation through digital and financial literacy. The Juhu Walkers Group says that the Juhu beach in Mumbai is 80 per cent clean. The group has created a WhatsApp group where the local MLA and corporator have also been added and regular monitoring ensures that the beach remains clean. The group has also been instrumental in saving marine life and often returns marine fauna back to the sea. Problem of drinking water a collective problem, says Amitabh Bachchan. John Abraham says that consideration for society a must as it is our collective responsibility to make the environment a better one. In Allahabad, sand and wall art is being used by Allahabad University students to create awareness about the Swachhata Hi Seva campaign. Prerna Arora, co-founder of KriArj Entertainment says how happy she is about the response to Toilet - Ek Prem Katha and stresses on the importance of films which talk about the social problems on the country. 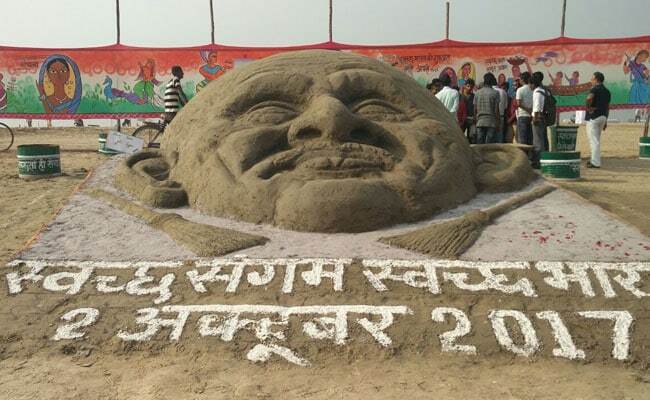 In Allahabad, sand and wall art is being used to create awareness about the Swachhata Hi Seva campaign. 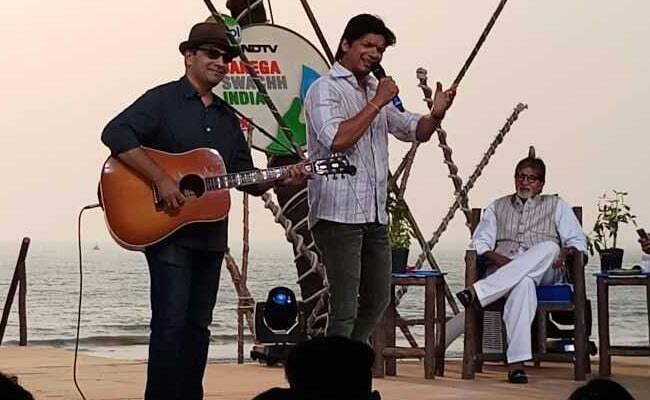 Shaan comes back on stage at the Banega Swachh India cleanathon to sing one of his popular chartbusters and receives immense praise from Amitabh Bachchan. Kailash Kher is back at the Banega Swachh India cleanathon to mesmerise with his powerful vocals. 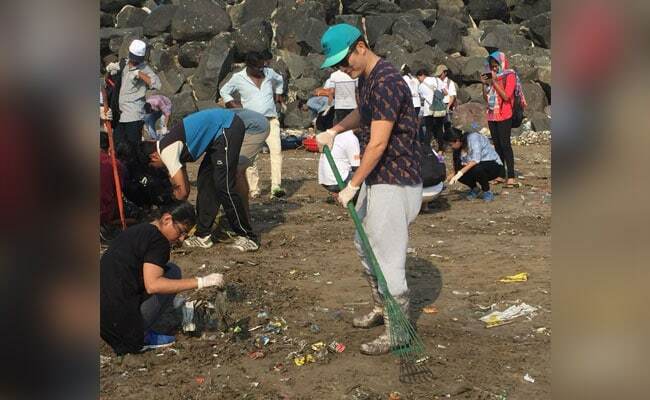 Actor and television anchor Meiyang Chang thanks Afroz Shah for his galvanising efforts to gather people and says that if households can be kept clean, then cities too can be kept clean. Afroz Shah, one of the architects of Versova beach cleanup, says that his complaint on Versova was to himself. In the last two years, Mr Shah and his team of volunteers have managed to pluck out 7,800 tonnes of garbage. The United Nations has termed Mr Shah's initiative as the biggest beach cleanup in history, says Mr Shah. 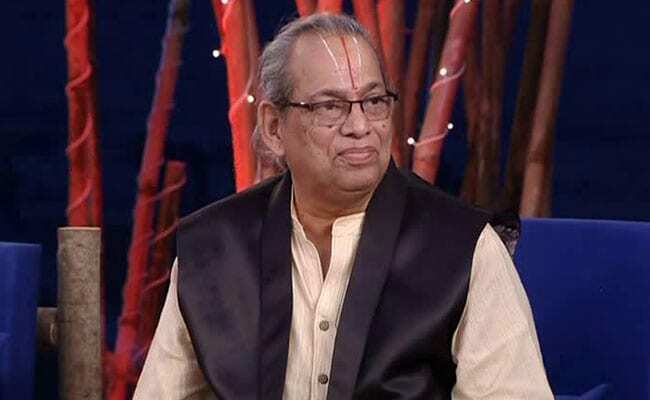 Pujya Swami Chidanand Saraswati, co-founder of Global Interfaith WASH Alliance says that sanitation and meditation go hand-in-hand and that the world is one big family where cleanliness is of high importance. Apurva Bhandari, founder of Sankalptaru, an environmental organisation which plants trees, talks about his plans to plant over a lakh trees across the Ganga basin to check pollution in the river. Punjab aims to go open defecation free by the end of December 2017 and already 12 districts of the state's 22 districts have been declared open defecation free. 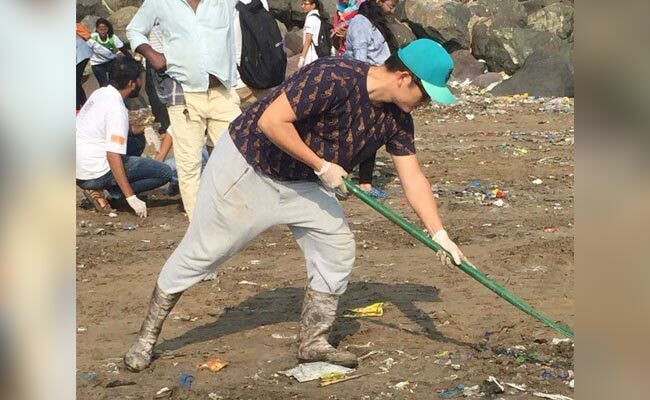 Actor and television anchor Meiyang Chang lend his hand in cleaning up of the Versova beach during the Banega Swachh India cleanathon. Andhra Pradesh Chief Minister Chandrababu Naidu expresses his happiness to be associated with the Swachhta programme. Mr Naidu confirms that urban Andhra Pradesh is already open defecation free, the same will be attained for rural Andhra Pradesh by March 2018, along with the construction of 22 lakh toilets. 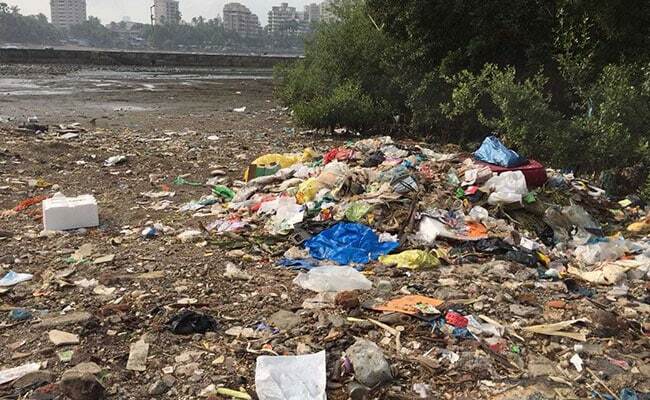 Volunteers have joined hands to clean Versova, one of Mumbai's most polluted beaches, which was chosen as a cleanup site for the Banega Swachh India cleanathon. Singer Shaan gives a special message on the importance of implementing #Mere10Guz, urging fans to keep surrounding spaces clean to make a difference. Meeting air quality guidelines is highly important, but severe air pollution, both indoors and outdoors have resulted in severe crisis, and even death in several cases. 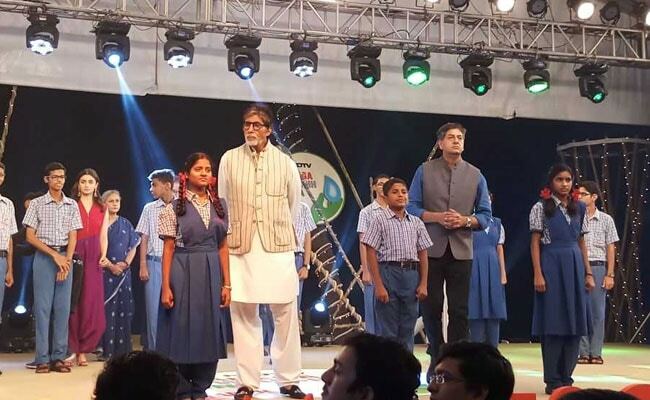 A soulful poem on cleanliness by a Sherwood School student left campaign ambassador Amitabh Bachchan mighty impressed! 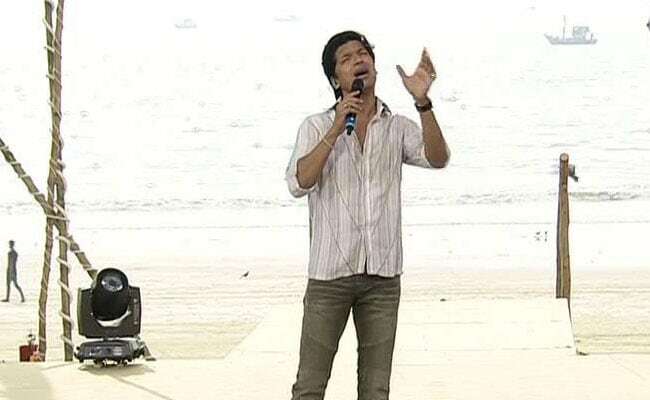 Singer Shaan graces the Banega Swachh India cleanathon stage with his rendition of the popular bhajan, Vaishnava Jana To. 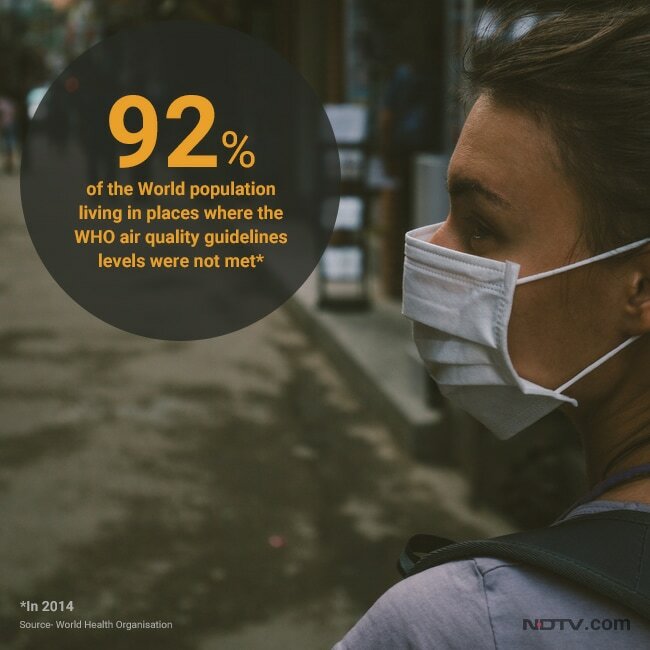 Globally, the numbers for air pollution are even more dangerous. 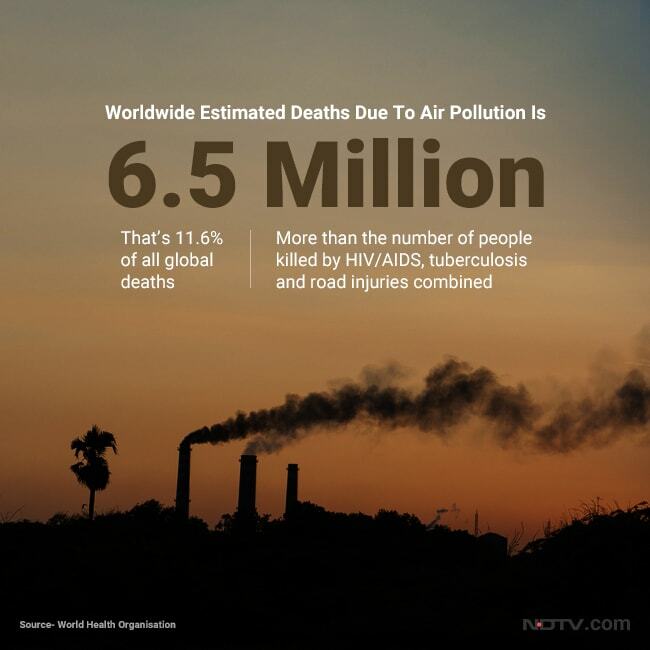 6.5 million annual deaths are estimated to be caused by air pollution. More than a million people die every year in India due to air pollution, signalling a stark crisis. 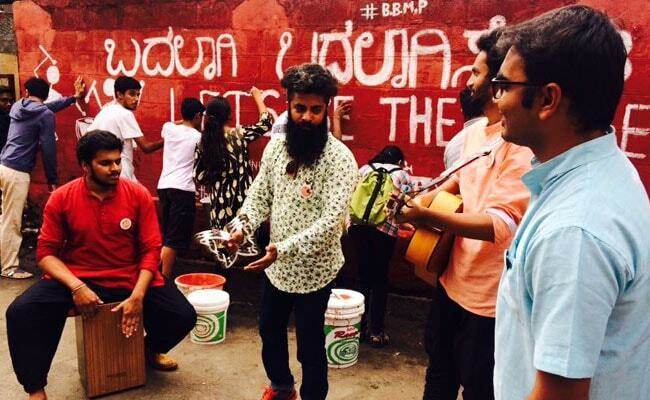 The Bengaluru based folk/fusion band Swarathma are making their presence felt at the Banega Swachh India cleanathon. Performing in Uthrali, the band is accompanied by a group of volunteers engaged in wall painting which spells out the message of being the change. 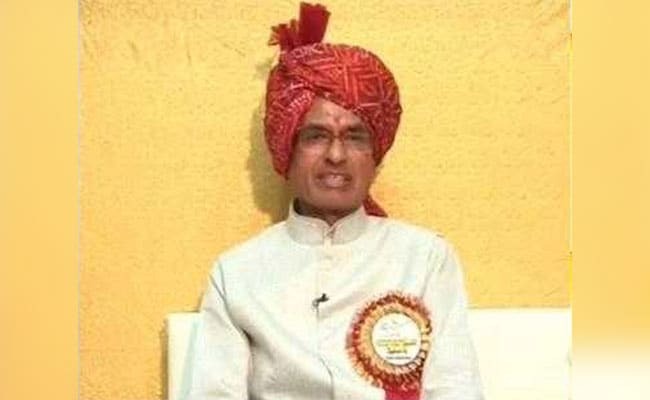 Madhya Pradesh Chief Minister Shivraj Singh Chouhan joins the Banega Swachh India cleanathon, hailing Madhya Pradesh's performance for achieving considerable success in the #Swachhta movement. The state has a better rural sanitation coverage than the national average and 378 urban local bodies have become open defecation free. The CM says that the state aims to go completely open defecation free by the end of 2018. 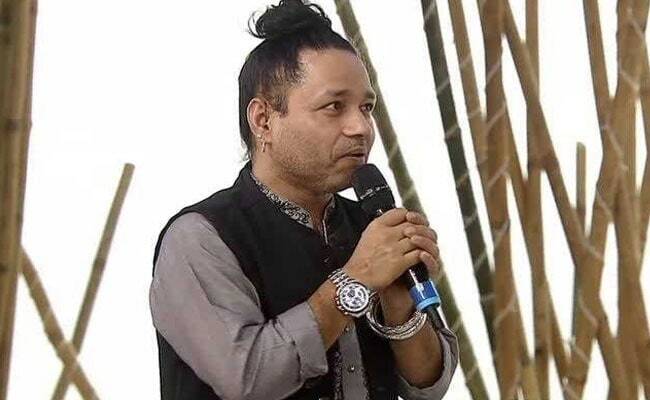 Kailash Kher's message to people at the Banega Swachh India cleanathon, urging them to implement #Mere10Guz for a clean India. 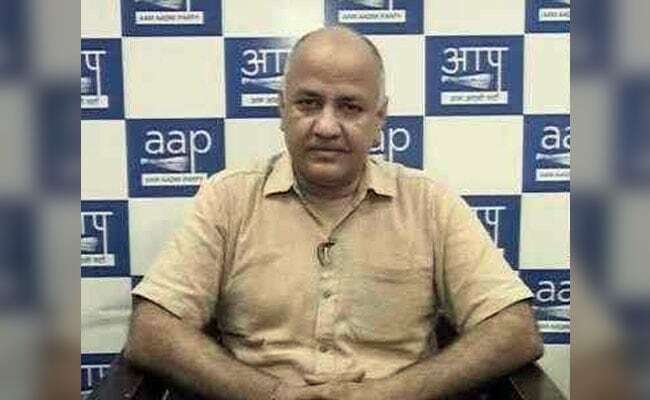 Manish Sisodia, Deputy Chief Minister of Delhi talks about air pollution at the cleanathon, saying that he is hoping that crop burning in Haryana and Punjab will not be an issue this year, as Delhi's air had suffered badly last year because of crop burning. The Deputy CM also said the much talked about odd-even scheme may be brought back to control air pollution caused by emissions from vehicles. 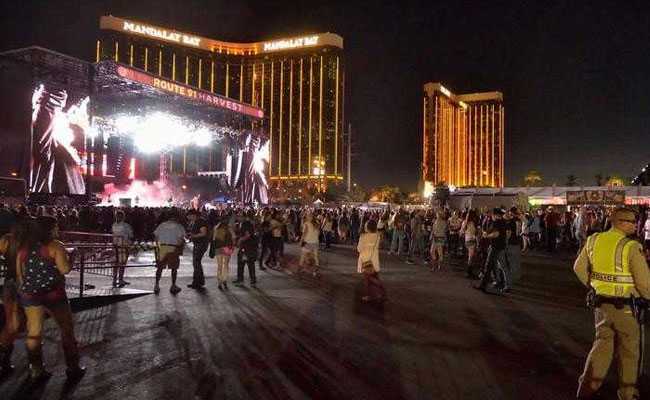 Latest Update: At least 20 people have died and more than 100 wounded, some in critical condition at a hospital in Las Vegas after gunman opened fire at a concert near the Mandalay Bay Resort and Casino. 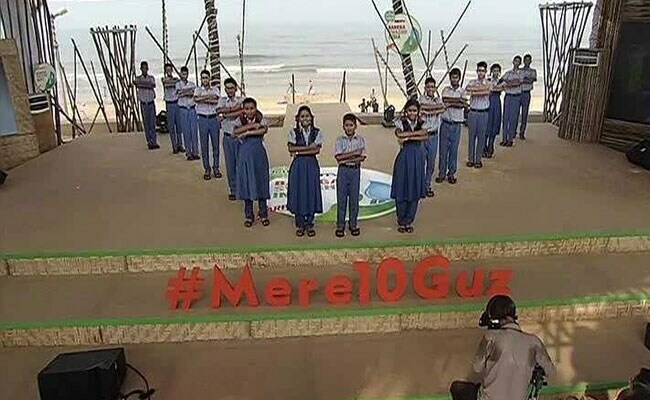 Singer Kailash Kher, after a soulful performance of Vante Mataram, urges people to understand the importance of #Mere10Guz and asks them to implement necessary steps to maintain cleanliness. Students from Lawrence School in Sanawar, Himachal Pradesh participate in the Banega Swachh India cleanathon, cleaning garbage from surrounding areas. Plastic, India's bane has been a serious environmental concern for many years now. 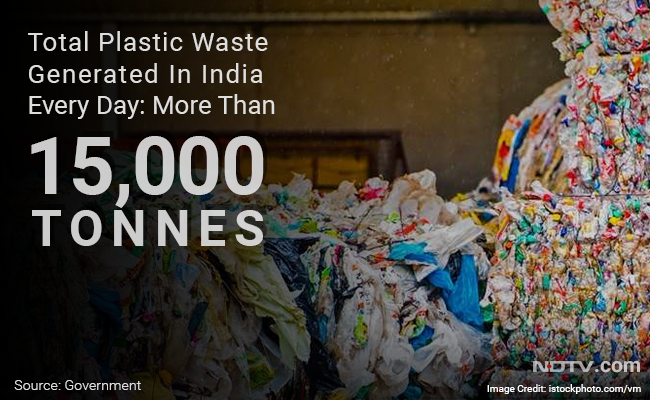 India produces a massive 15,000 tonnes of plastic waste daily. A Swachhata Hi Seva Pakhwada was organised at the Janta Jawan Camp, Okhla, New Delhi. 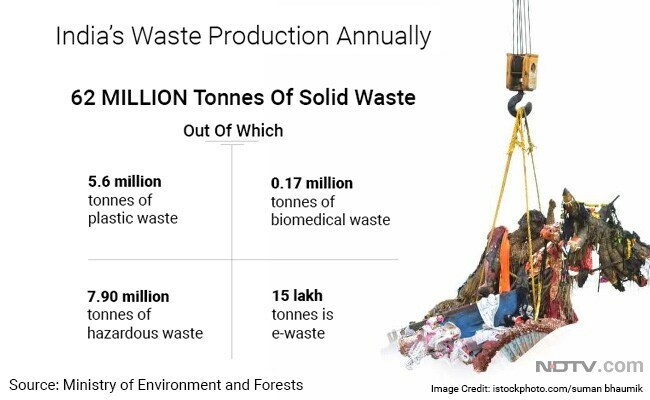 India's annual waste production is all about staggering numbers and how they are hampering the environment of the country. Here are some important figures related to the waste problem in India. 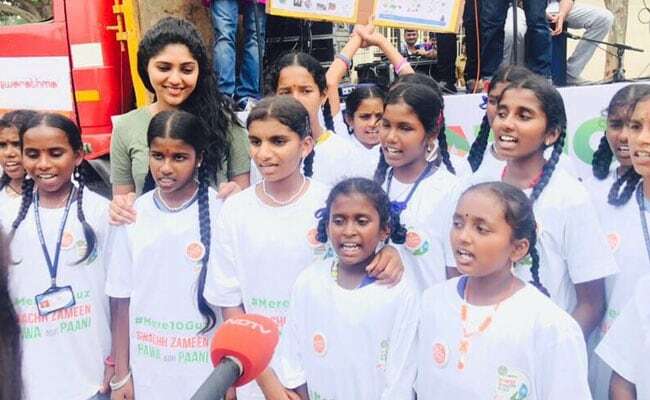 Kannada actress Samyukta Hornad lends her support to the #SwachhIndia campaign at the Banega Swachh India cleanathon, collaborating with a bunch of school kids to participate in the cleanathon. Though waste is a major problem in India, some of India's cities have successfully managed to segregate waste and have become model cities for successful waste management. Alleppey and Mysuru are two cities which have successfully implemented waste management techniques. Speaking at the Banega Swachh India cleanathon, actor Anupam Kher stressed on the importance of #Mere10Guz and how keeping 10 yards clean will translate to a cleaner India. 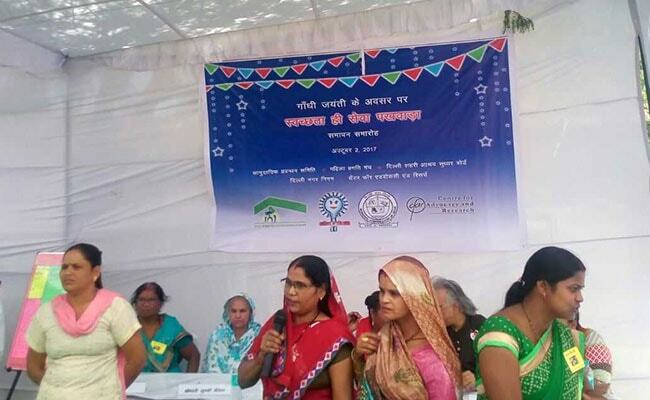 In Delhi's Sadiq Nagar, waste collectors are being trained on waste segregation under the Socho Alag campaign, as a part of the Banega Swachh India cleanathon. 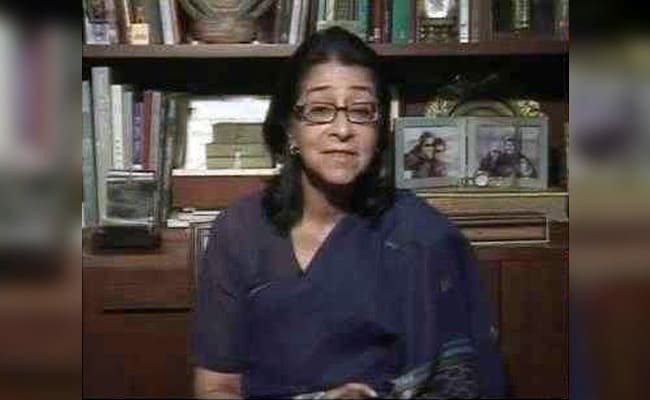 Naina Lal Kidwai, Chair, India Sanitation Coalition, praises districts with District Collectors who are strong and motivating in nature, and collectors in charge of such districts have ensured that their districts have done well in making them open defecation free. People must understand why using toilets is important. Health benefits of using toilets, especially diarrhoea killing children, should be recognised. 85 to 90 per cent usage of toilets is happening in rural areas, which is a good sign. 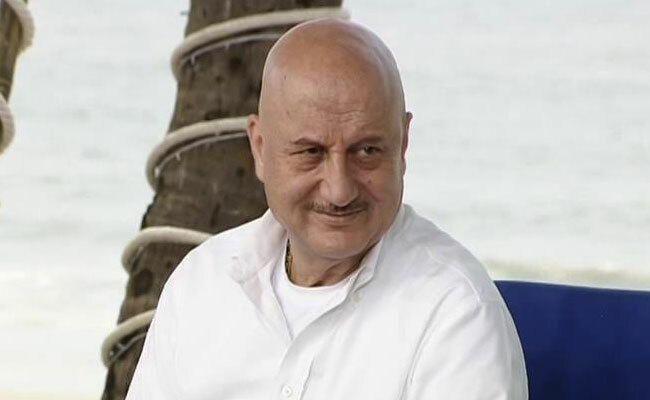 Actor Anupam Kher joined the Banega Swachh India cleanathon and said that ever since the launch of the Swachh Bharat Abhiyan, the changing awareness among people is visible. 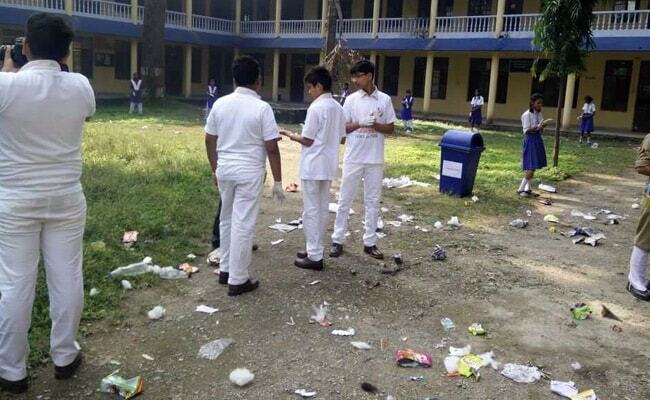 Littering on the streets is met with questions and not ignorance. People should be made aware of the ill effects of open defecation and that awareness must come at individual levels. 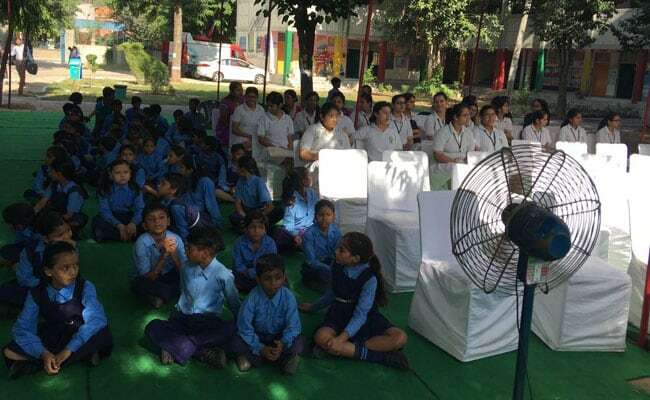 In Dehradun's Colonel Brown School, students participated in the Banega Swachh India cleanathon, and contributed towards a #SwachhIndia by partaking in composting activities. 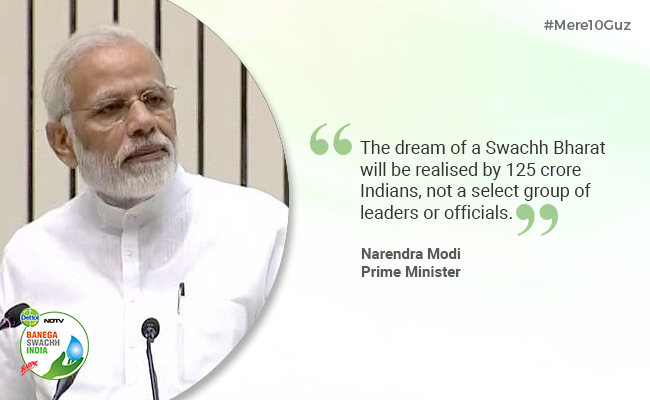 Prime Minister Narendra Modi urges 125 crore Indians to come together to give shape to the dream of a Swachh India. 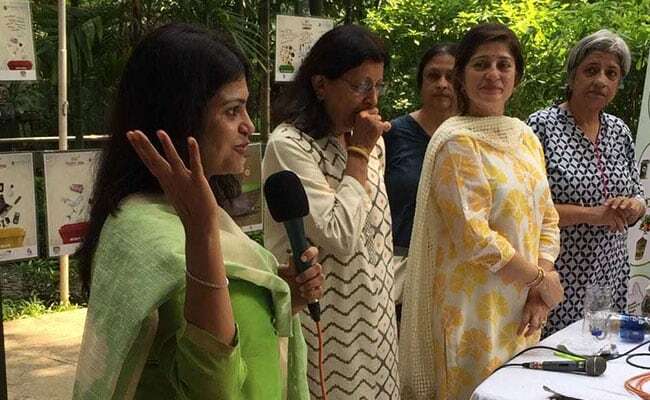 Harshita Narvekar, local Municipal Councillor of Bandra, backs citizen initiatives like waste segregation and upcycling at the Banega Swachh India cleanathon in Mumbai. 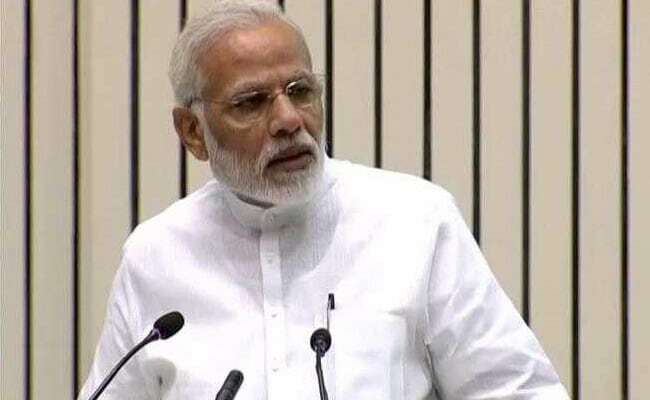 Addressing the nation on the occasion of Rashtriya Swachhta Diwas, Prime Minister Narendra Modi says that everyone likes cleanliness, but the problem in our country is the lack of willingness to do it ourselves. Even a 1,000 Mahatma Gandhis, a 1,00,000 Narendra Modis and several Chief Ministers cannot make the dream of a Swachh Bharat True. But it over 120 crore Indians come together, India will definitely become cleaner. 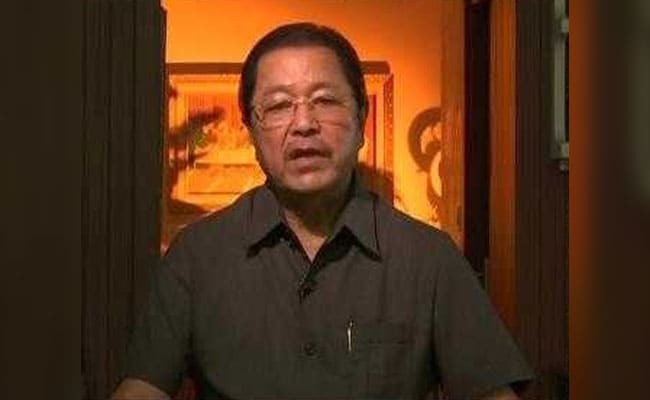 Mizoram Chief Minister Lal Thahawla, during the Banega Swachh India cleanathon says that Clean Mizoram and Green Mizoram programme was started decades ago. Civil society, NGOs and churches come forward together to maintain the cleanliness of Mizoram. Master Blaster Sachin Tendulkar announced his commitment to the cause of cleanliness, tweeting that each of us can contribute towards making India both Swachh and Swasth. 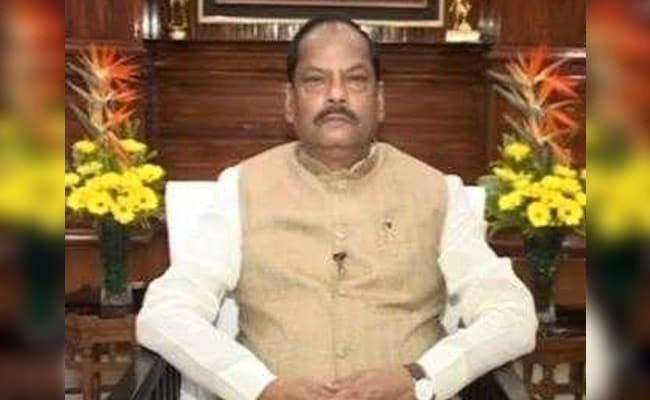 Joining the Banega Swachh India cleanathon, Raghubar Das, Jharkhand Chief Minister, says that the reason why Jharkhand has done well in the Swachh Bharat Abhiyan is because of how conscious people have become towards sanitation. The #SwachhataHiSeva campaign has played a big role in ensuring that people adopt safe sanitation. 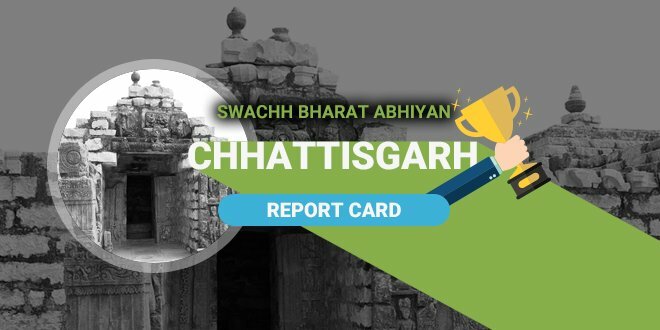 9 cities have featured in the top 150 clean cities under the Swachh Bharat rankings. The Chief Minister also says that plastic has been totally banned in Jharkhand and people have instead started using cloth as an alternative. See the waste around, was Puducherry Lieutenant Governor Kiran Bedi's message to all public servants, at the Banega Swachh India cleanathon. 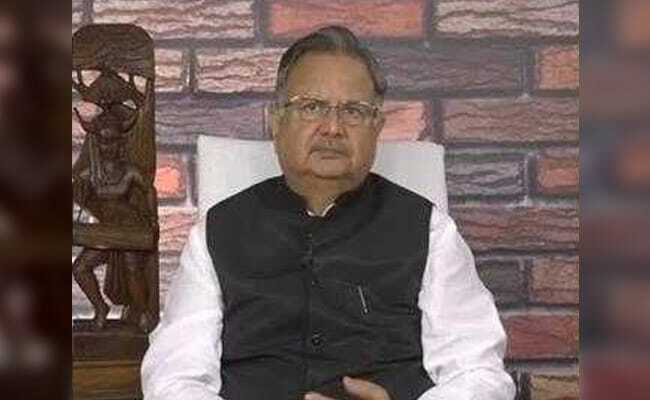 Chhattisgarh Chief Minister Raman Singh says that his government has prioritised behavioural change in sanitation, resulting in 8,000 panchayats in the state become open defecation free, as well as the state's urban areas already attaining the ODF certificate. To ensure people used the toilets they built, the government paid three months after the construction of a toilet was completed. 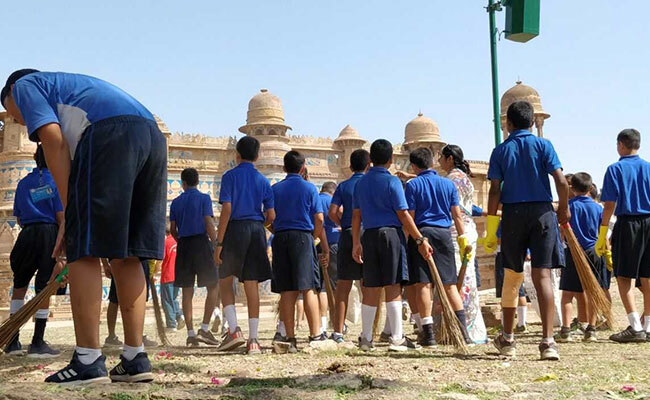 At Gwalior's Man Singh Palace in Madhya Pradesh, students from Scindia School participate in the Banega Swachh India cleanathon, clearing the palace premises of garbage. 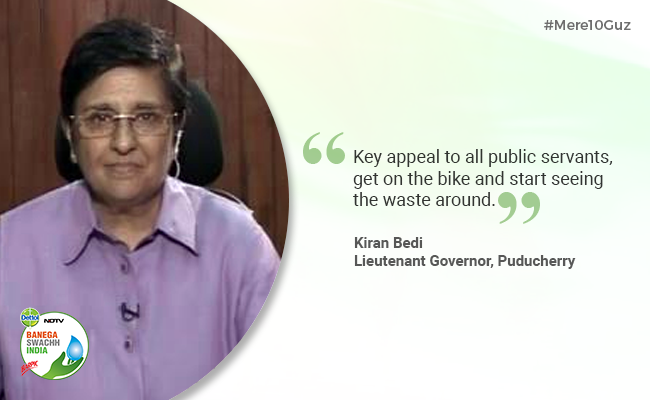 Joining the Banega Swachh India cleanathon, Kiran Bedi, Lieutenant Governor of Puducherry urges public servants, especially municipal commissioners to drive bikes and walk the dirty streets so that change comes gradually and India becomes cleaner by next year. 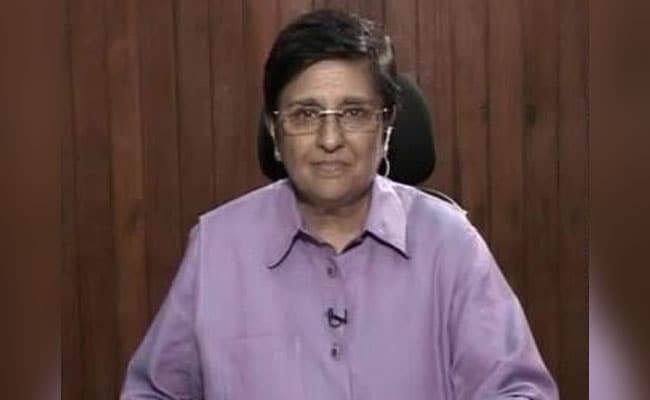 Joing the Banega Swachh India cleanathon, Kiran Bedi, Lieutenant Governor of Puducherry urges public servants, especially municipal commissioners to drive bikes and walk the dirty streets so that change comes gradually and India becomes cleaner by next year. A gathering of school students in Allahabad as a part of the Swachhata Hi Seva campaign. 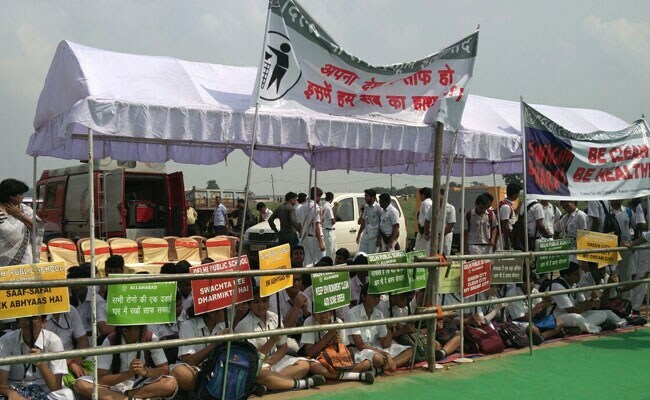 Students are seen holding placards, spreading the message of cleanliness during the Banega Swachh India cleanathon. 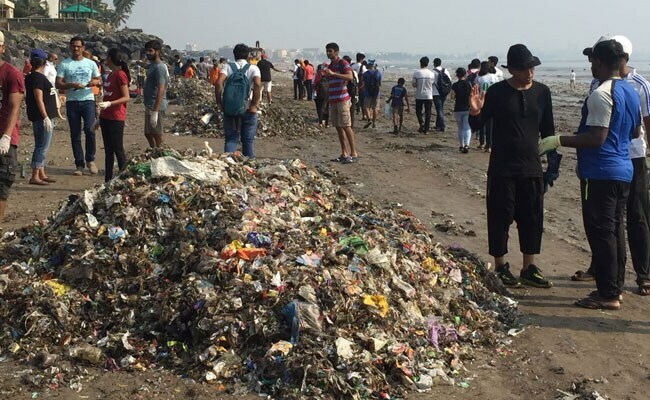 At Mumbai's Chimbai beach, the NGO United Way has been instrumental in cleaning up a lot of the 4-feet high garbage mound that dominated the beach a few years back. 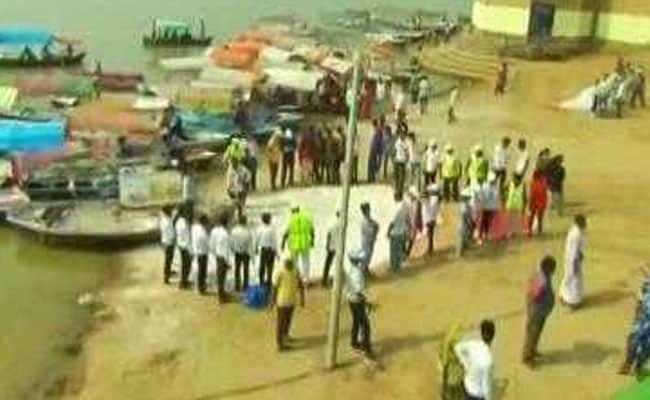 For the Banega Swachh India cleanathon, a gathering of young and old have come together to clean the Chimbai beach. Dr. Raman Singh, Chief Minister of Chhattisgarh will soon join the Banega Swachh India cleanathon. March 2018 is the date Delhi has set to achieve the open defecation free status. Cleaning going on in full progress at Dehradun's CNI Girls Inter College, as a part of the Banega Swachh India cleanathon. Speaking about the Banega Swachh India campaign, Nitish Kapoor, SVP Regional Director, South Asia at Reckitt Benckiser expresses his happiness on the campaign's success. 4 districts in Maharashtra have become open defecation free with Reckitt Benckiser's toilet building initiatives, which has built nearly 45,000 toilets till now. RB has also been instrumental in setting up a World Toilet College which has trained 5,000 women masons to construct toilets in villages. At the Banega Swachh India cleanathon in Allahabad, Deputy Magistrate Sanjay Kumar says that the district will become open defecation free by December 2018 and more than 10,000 Swachh volunteers are working on ground to make ODF Allahabad a reality. Specially abled children perform Hum Honge Kaamyab at the Banega Swachh India cleanathon to reiterate the message of being successful at making a #SwachhIndia. 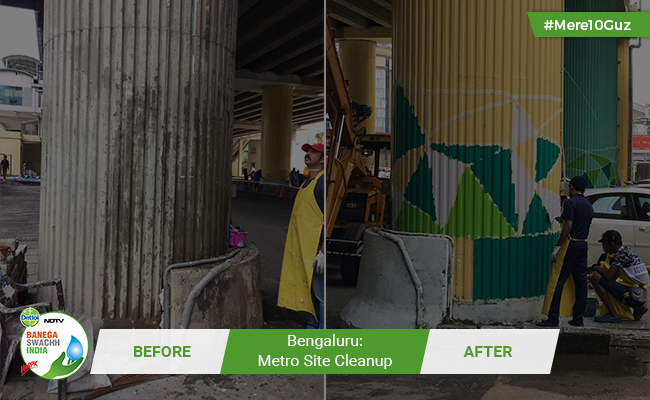 Bangaloreans have come out in big numbers to clean up their metro stations! A daily commute option, the JP Nagar Metro Station is being cleaned up by the Ugly Indian, a waste cleanup initiative. 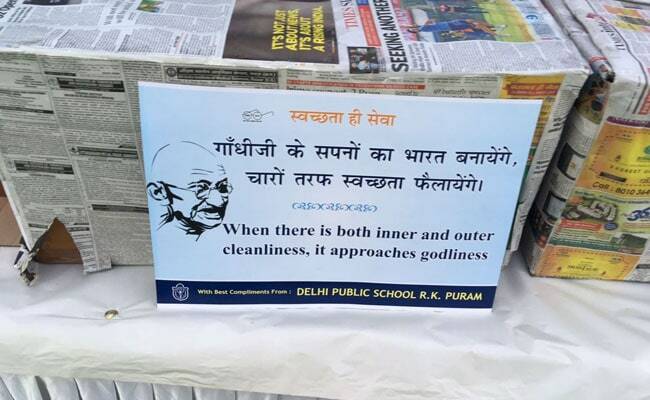 A message from students of Delhi Public School in RK Puram, on giving reality to Mahatma Gandhi's dream of a clean India. 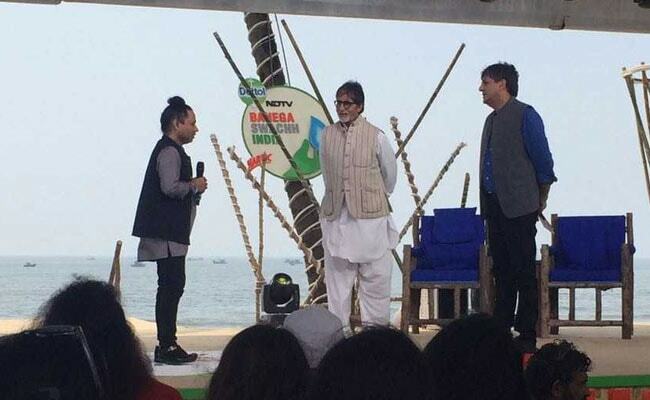 Setting the agenda for the Banega Swachh India 12-hour cleanathon, Amitabh Bachchan encourages people to embrace Swachhta by littering less and composting more, and keeping the 10 surrounding yards clean and green. Students at the SDMC Primary Co-Educational School at RK Puram are ready to spread the message of Swachhta at government schools. 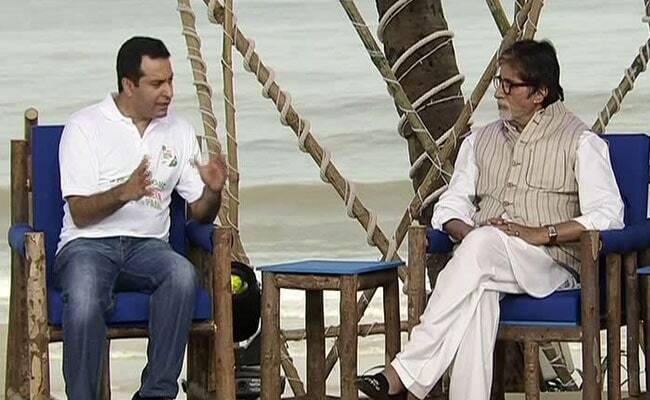 Amitabh Bachchan is joined by Vikram Chandra and Nitish Kapoor, who discuss the irony of throwing waste in oceans as oceans also throw it back at us. Mr Bachchan says that by keeping 10 yards of our surroundings clean, the whole city will inevitably become cleaner. 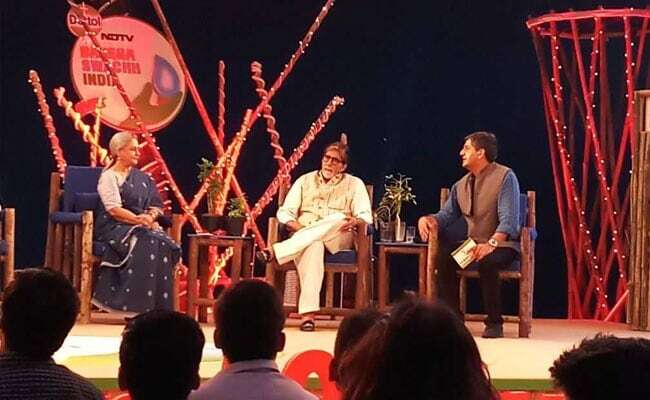 At the 12-hour Banega Swachh India cleanathon, campaign ambassador Amitabh Bachchan highlights the problems of lack of toilets, plastic pollution, unclean rivers and toxic air and asks to pledge together to fight towards a Swachh India. 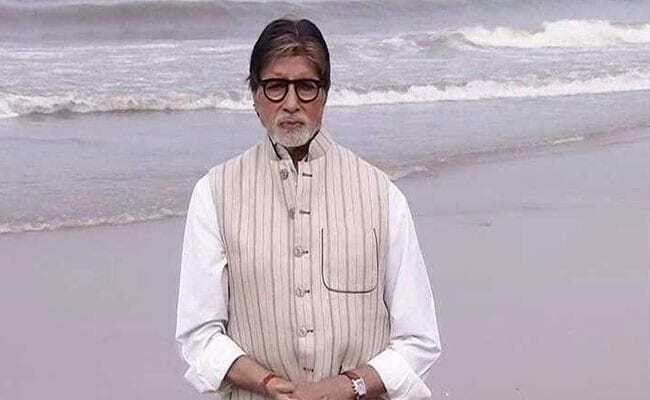 Beginning the 12-hour Banega Swachh India cleanathon, campaign ambassador Amitabh Bachchan highlights the problems of lack of toilets, plastic pollution, unclean rivers and toxic air and asks to pledge together to fight towards a Swachh India. Roseland Residency CHS Ltd Pimple Saudagar, Pune has implemented 3 way or 2bin1bag waste segregation at source (organic, recylable and reject), plastic and e-waste collection bin in campus to collect clean and dry plastic for recycling and e-waste for recycling. We also compost all garden waste and leaf waste in house and same compost is used for our gardens. These all initiatives are aimed to reduce waste going to landfills. We also have a STP plant which treats around 1 lakh ltrs of water and around 70% is used for gardening. We have also implemented Rain water harvesting and our society is tanker free for last 7 years. We have also installed around 2000 water saving faucet aerators in all flats. We have multiple awards to our name. We have also done extensive work in sparrow conservation and our society won the 2016 Wipro Nature Forever Sparrow Award for sparrow and environment conservation. We aim to be a sustainable and smart community and we have taken multiple initiatives as part of our contribution towards Swacch Bharat. We are also promoting composting of kitchen waste at home in our society and in our area through WhatsApp group and training sessions. 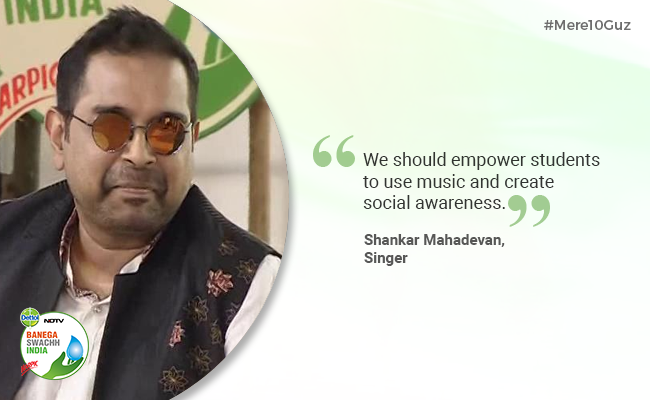 Schools have an important role to play for a #SwachhIndia. Amitabh Bachchan highlights how important their contribution can be. 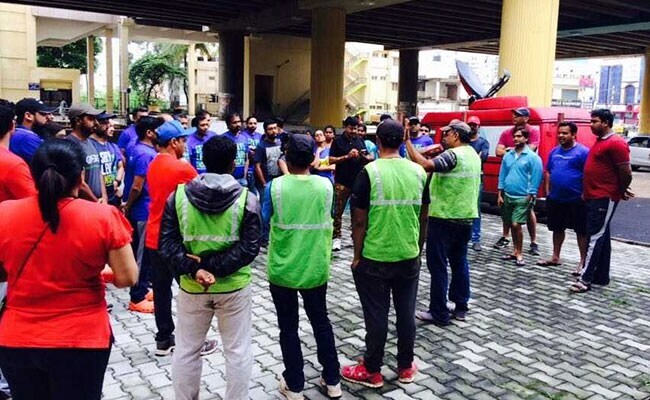 Volunteers in Bengaluru gather themselves ready for participation in the Banega Swachh India cleanathon. Pillars once covered in posters have been coloured and decorated in Bengaluru's JP Nagar Metro station. 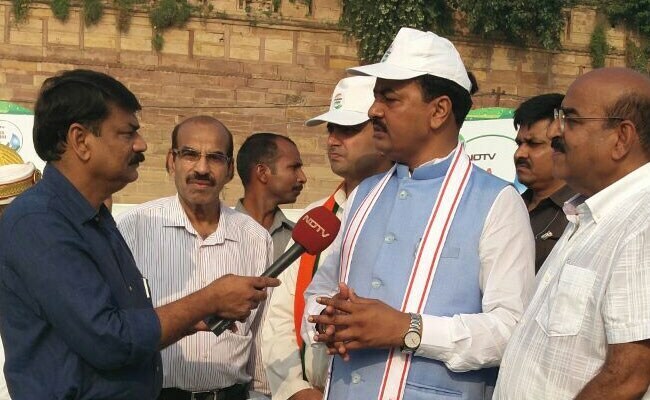 Keshav Prasad Maurya, Deputy Chief Minister of Uttar Pradesh, at the Banega Swachh India cleanathon. 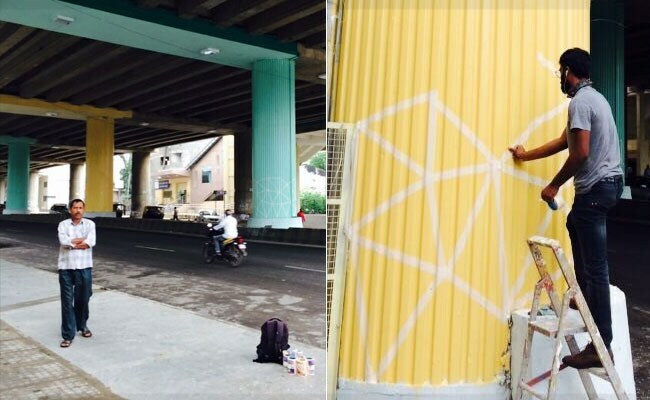 Pillars once covered in posters have been coloured and decorated in Bengaluru. 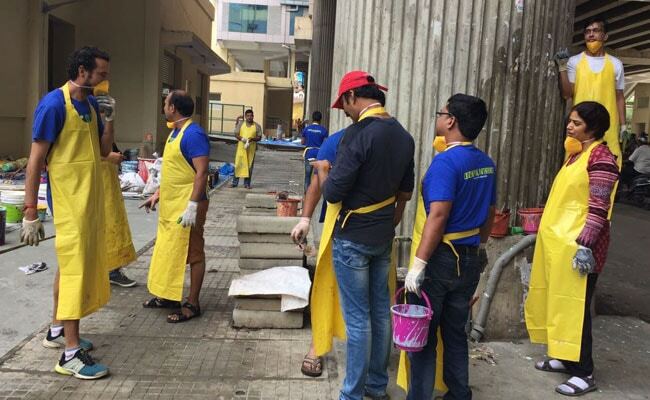 Preparations in full swing for the Banega Swachh India 12-hour cleanathon. 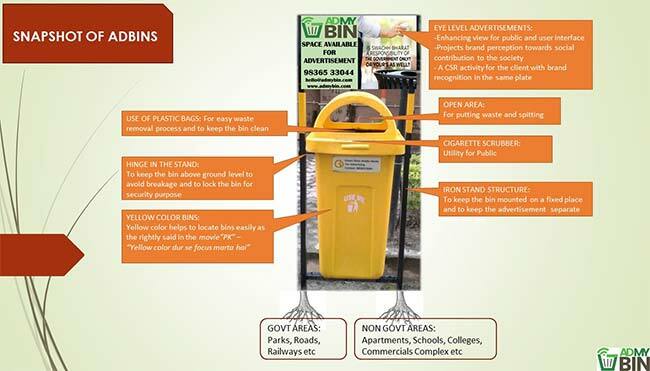 We are a group of young Swachhagrahi have chosen to opt out of our professional engagements to build a social enterprise that installs and maintains waste bins by monetizing them via advertising. We have 100+ bins already installed and we are looking to growing fast. We are also in touch with the MoUD GoI and Swachh Bharat Mission for scaling our impact. 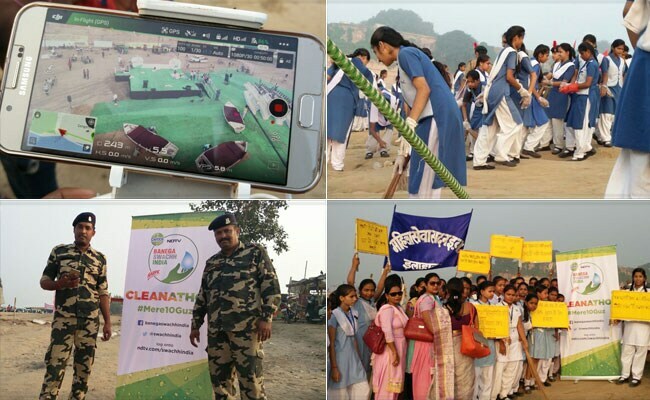 Participation in cleanliness from all quarters in the cleanathon sent positive signals for Allahabad, which ranked a low 247 in this year's Swachh Survekshan. 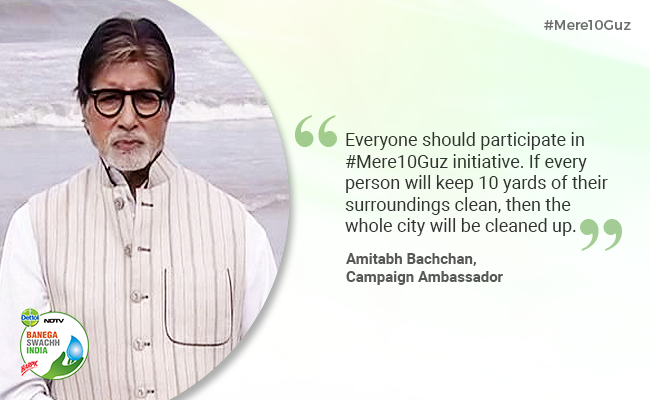 #Mere10Guz: Little more than an hour to go for the Banega Swachh India 12-hour cleanathon. Watch live with Amitabh Bachchan, 9 AM onwards. Singer Kailash Kher gears up for his performance at the NDTV-Dettol Banega Swachh India cleanathon. 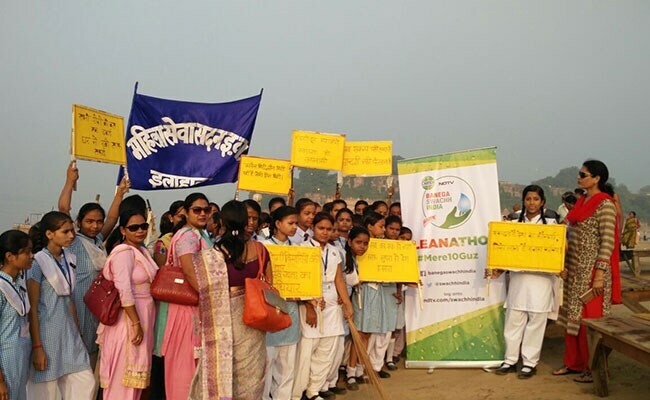 Several NGOs and student volunteers from St Anthony Convent School, Allahabad, came together to participate in the cleanathon and engaged in activities of cleanliness during the activity. 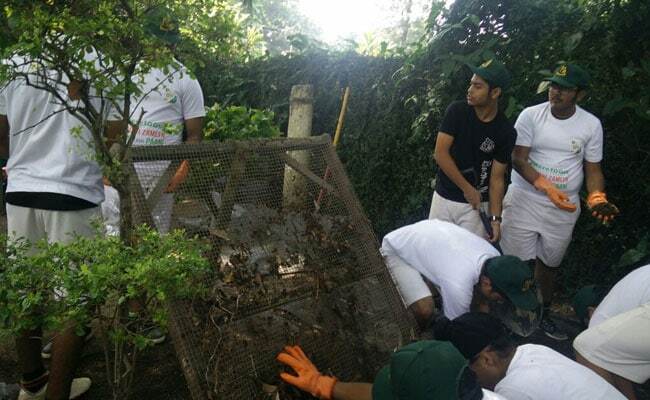 Several NGOs and student volunteers came together to participate in the cleanathon and engaged in activities of cleanliness during the activity. 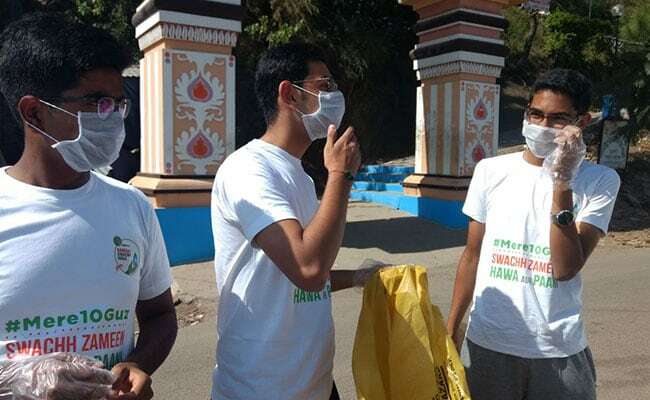 The Banega Swachh India 12-hour cleanathon at Allahabad saw the participation of several volunteers who came forward to participate in cleanliness activities. Hon. Prof Rajagopalan Vasudevan your invention of plastic on the road is fantastic. One question platic when heated especially polyethylene it its disintegrate and the compound I read it is concinogen. Hope your method would not effect such catastroph. God Bless You ! Vow to keep our surroundings clean and litter free should be included in daily prayers that are conducted in educational, religious and other commercial institutions. There is a need to first clean their minds and souls respectively. To hell with this fake swachh Bharat mission. This mission ended before it started. I am not talking about other states but will only talk about UP and Gujarat. See the filth, garbage, open seepage. See the Ganga, the gau matas which are increasing the filth. All over the country the epidemic is on rise, people, especially kids are severely affected by dengue, malaria, and other types of diseases because of the filth all around. It will be better if these khakhi chaddis first clean their minds, hearts and souls before taking up swatch bharat.